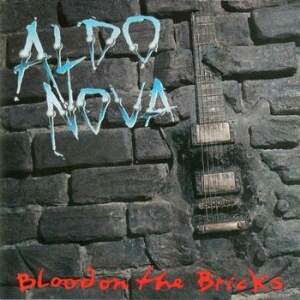 By the late 80's and early 90's, Canadian AOR legend Aldo Nova had disappeared from public view though he was still active in the music industry. He hadn't been seen since 1985's excellent 'Twitch' (an album he has since derided, strangely enough), a purist AOR album, and with involvement from Jon Bon Jovi, his return in 1991 heralded a few changes, not all of them convincing. There's a cowboy theme running through this album no doubt influenced by Bon Jovi's success during those missing six years. It's certainly something that could've been avoided, and as a result this album was mostly absent from my CD player during 1991. Revisiting this album many decades later, it's probably not as bad as I remember it to be, though certainly not as good as those first three Nova albums (not hard to imagine why), but this one does have its moments. The flashy guitar work is still there, the production values and songwriting (8 of which are JBJ CO-WRITES), are still way above average, as heard on songs like 'Medicine Man' and 'Young Love'. I wasn't too keen on the overly done slide guitar, which takes Aldo more to the Cinderella side of the kerb rather than the 1982-1985 era which made him popular. 'Modern World' and 'Touch Of Madness' are also pretty good, while the sole Aldo written 'Bright Lights' is probably the pick of the bunch. The others I can take or leave it. Now signed to Jambco Records which was Jon Bon Jovi's label, the album wasn't a great success but it was good to see Aldo back in the spotlight again, if only fleetingly. The association promised much, but the end result was overall - disappointing. I should go the whole hog and write something about the Nova's Dream album from 1995 (or was it 96? ), but I don't really like it so I'm not inclined to do anything with it.